Evergreen is committed to making Evergreen Brick Works an accessible destination for our diverse community, including people with disabilities. Our shuttle bus is equipped with a wheelchair lift and tie-down. 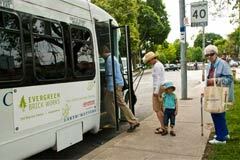 The bus can also accommodate one stroller or large assistive device per trip. We have eight paid parking spots reserved for vehicles with Accessible Parking Permits. Seating is provided throughout the site at bistro tables, benches and picnic tables. In the Young Welcome Centre and the Centre for Green Cities building, accessibility features include an elevator, accessible single-stall washrooms, automated door openers, and Braille signage in the elevators and conference centre. The accessible washroom is located on the ground floor, with accessible stalls located in the washrooms of each of the five floors. While the site and park area are accessible for most people, there are some bumps, tracks and pebbles at this old brick factory. Service animals are allowed in areas of Evergreen Brick Works that are open to the public, including the Farmers’ Market and the shuttle bus. When it is not readily apparent that the animal is a service animal, staff or volunteers may ask for a document confirming the need for the service animal. We strive to make our programs and events as barrier-free as possible. Visitors and participants may use their own assistive devices. 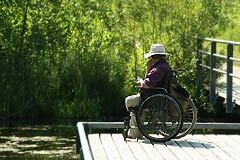 A support person accompanying a visitor with disabilities is allowed to stay with the visitor at all times, and is provided with free admission to Evergreen events (a fee may apply if a meal option is chosen). How are we doing? We welcome suggestions on improving access for all our events and programs. Contact us by phone (416-596-7670), by email or talk to us in person at the Welcome Desk. All documents, including our Accessible Customer Service policy, training records and written feedback process, are available upon request.